At CLEAN 2011, Pellerin Milnor Corporation introduced its new hydraulic design for the 48040 H-Series open-pocket washer-extractors. Now, the company is offering this hydraulic design in the larger (400-500 lb. capacity) 68036 model. This model incorporates a stationary housing and tilting interior cylinder, providing optimal structural integrity without compromising wash quality. With 16° load and 16° unload tilting angles, the ergonomics and fast wash cycles are ideal for any industrial laundry. This 300 G washer-extractor features Milnor's highly programmable Mark VI controller and maximum 16 liquid supply ports, both of which allow for more flexibility for use. The 68036 still features high ribs and ideal perforation pattern to maximize M.A.F. (Mechanical Action Factor) and dilution. Patented bearing housing design provides quadruple protection from water and debris intrusion—another smart Milnor advantage! 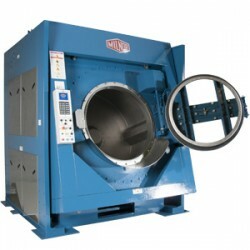 For more information on Milnor's 68036 H5N, please visit www.milnor.com, email milnorinfo@milnor.com, or call 504-712-7656.